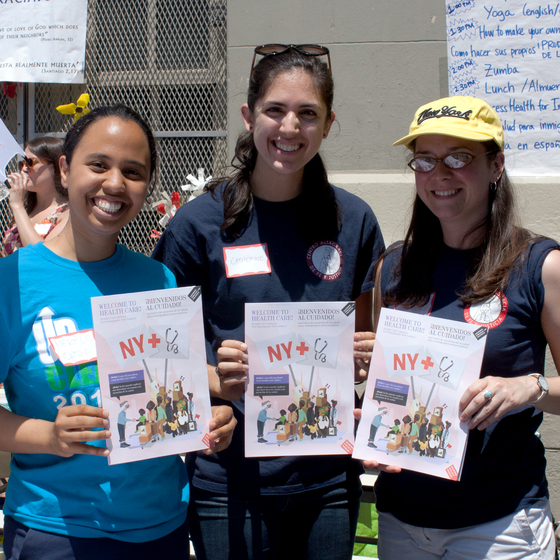 A collaboration with the Center for Urban Pedagogy (CUP) and New York Immigration Coalition as part of CUP’s 2016/17 Making Policy Public (MPP) series. 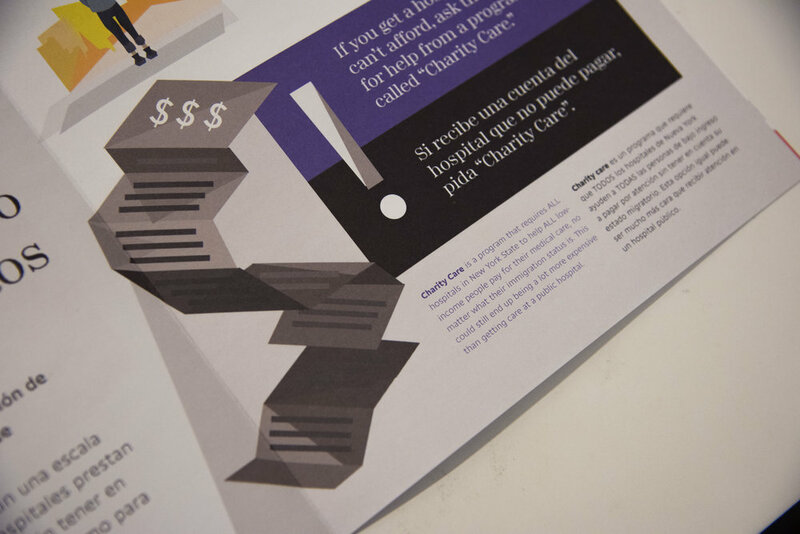 Our directive was to create a print foldout* that helped immigrants in New York State understand that they had health care options. Many immigrants either don’t know they have certain rights, or avoid the healthcare system altogether for fear that their legal status might be scrutinized if they participate. The issue is further complicated by the fact that healthcare involves a lot of technical/legal jargon which is difficult for immigrants who may already be facing language barriers. 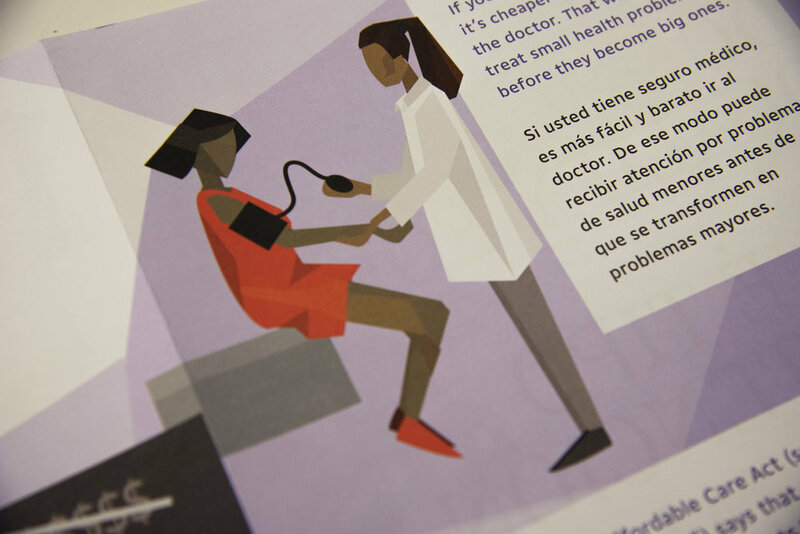 Our final product was a bilingual foldout (English + Spanish) that eschewed complex option-mapping in favor of a simpler, friendlier approach that helped immigrants take that first step into the healthcare system. We focused on two key points: reassuring users that the likelihood of immigration penalties was low, and pushing them to contact healthcare navigators for more information. Illustration was key in creating a warm, approachable tone to counterbalance the technical nature of the subject matter. It was highly successful through testing and release, and is currently slated for reprinting in Mandarin. Avoiding Autopilot: Three things a year-long print project reminded me about stepping out of my designer echo chamber. If we were going to create a healthcare tool, we had to first understand the NYS healthcare system at a basic level. To do this, we worked with Claudia Calhoon at NYIS. CUP translated our learnings into simple language (as much as possible) that could be understood by the general public. In laying out our content, we quickly realized that, even with our approachable copy, things were still overcomplicated. It was simply too much to comprehensively explain all the different healthcare options an immigrant might have with legal accuracy, in one foldout. To tackle this, we narrowed our focus to ‘Reassurance’. We wanted, first and foremost, for users to understand that they HAD healthcare options and that they could safely learn more from healthcare navigators without repercussions. Our prototype did well in testing but users wanted an even simpler look and feel. While making these refinements we also finessed our Spanish language translation and engaged Partner & Partners to polish the typography.